This Starbucks Coffee Cake Recipe may just be better than the real thing! 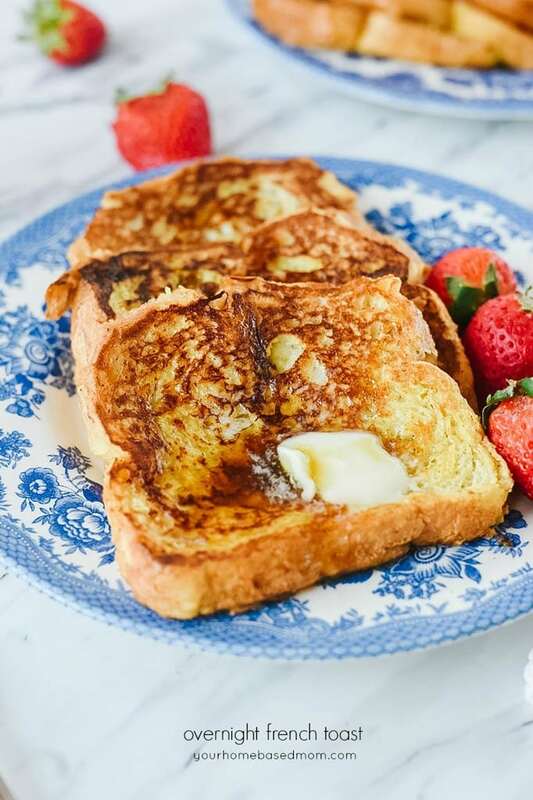 It’s the perfect addition to any brunch and is so good, you will be looking for a reason to invite over guests! One of my favorite things about Easter is Easter Brunch. 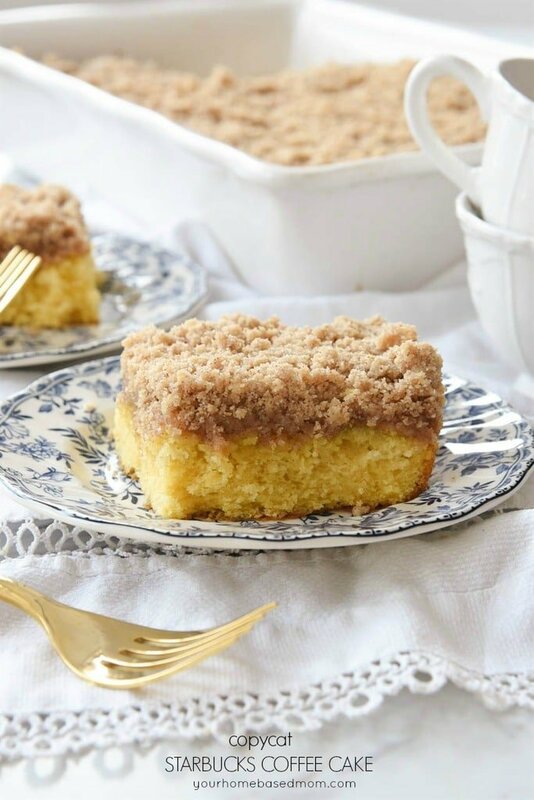 And one of my favorite brunch recipes is a good coffee cake. This Starbucks Coffee cake is the perfect easy brunch recipe. You start with a boxed yellow cake mix, which guarantees a moist cake. And the cake comes together in a snap. Perfect for a busy holiday. I love how tender and light the base of the cake is. 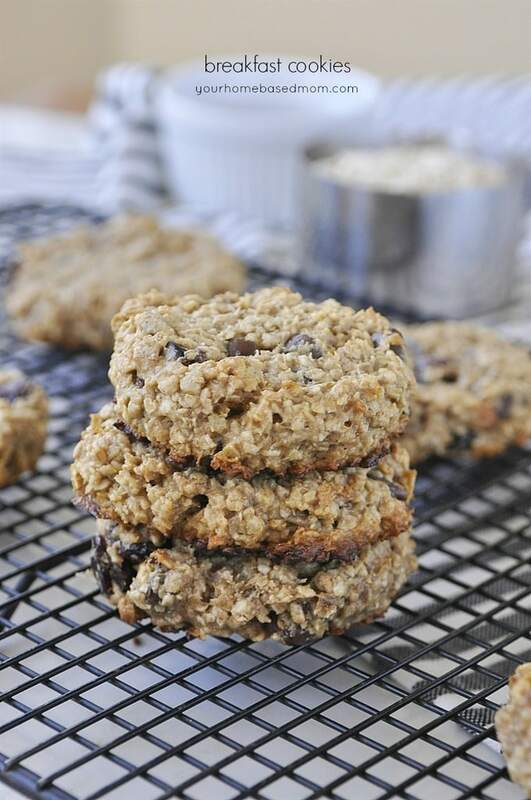 It is a perfect compliment to the heavier, crunchy, sugary topping! It’s my favorite part. 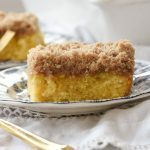 Usually foods with streusel toppings never have enough streusel topping for my liking but this Starbucks Coffee Cake has the perfect cake to topping ratio! 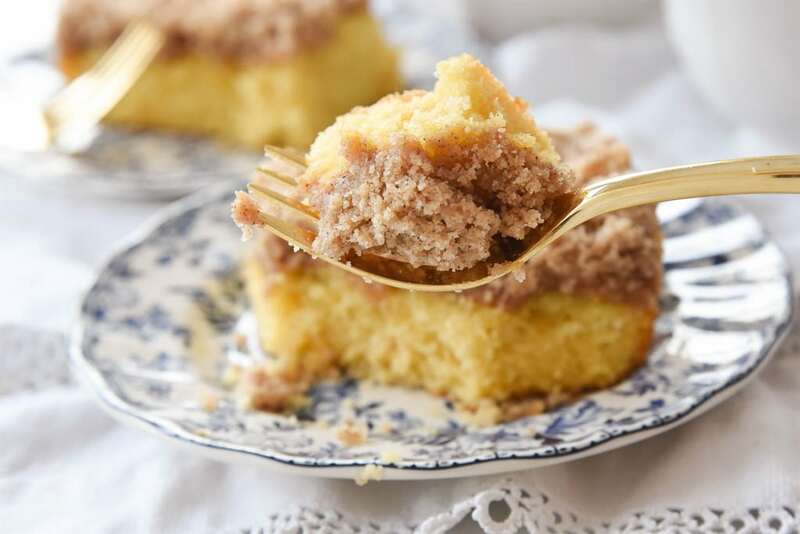 To make this coffee cake, start with a yellow cake mix. Prepare it in a bowl following the package directions. Then pour it in a greased baking pan and bake at 350 degrees until the center of the cake is just barely set. While it is baking, prepare the crumb topping by mixing together the butter, flour, cinnamon, brown sugar and vanilla with a mixer until crumbly. 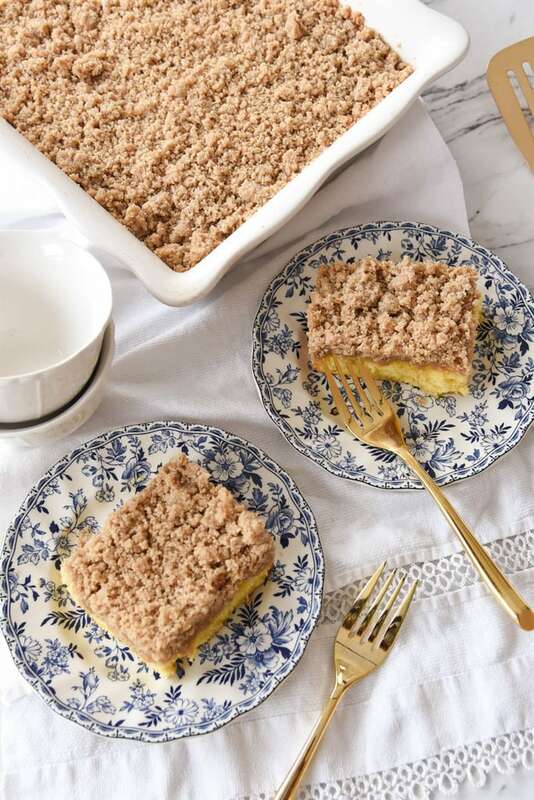 Immediately after cake is removed from oven, break the crumb topping into marble size pieces with fingers, sprinkling over the top of the cake. Then return the cake to the oven for another 10-15 minutes. 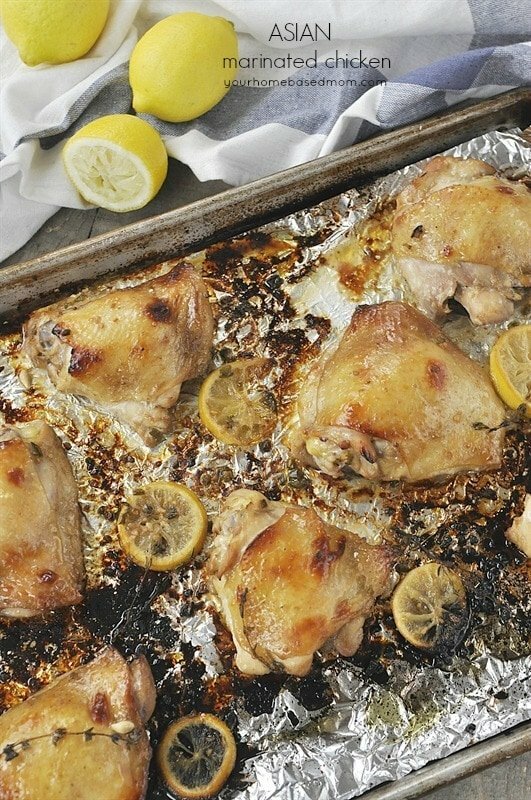 Once cook, remove from the oven, dust with powdered sugar, and serve. 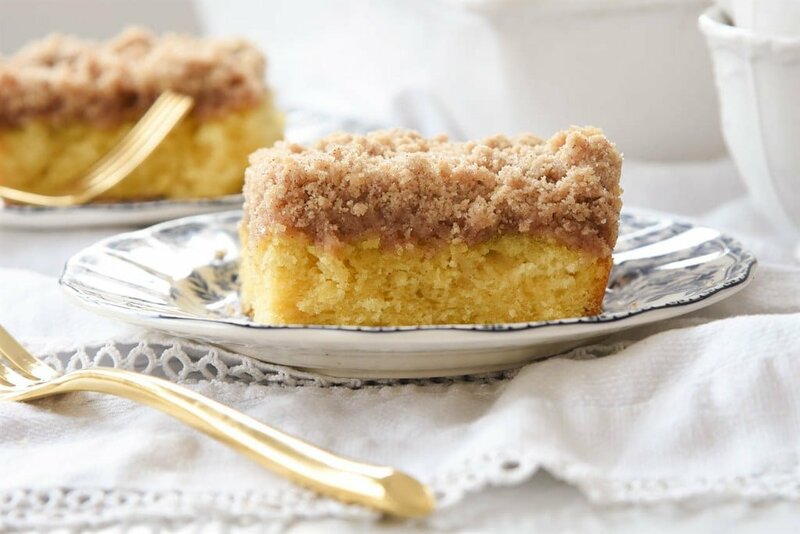 Everyone will love this coffee cake and you will love how easy it is to make. This Copycat Recipe for Starbucks Coffee Cake may just be better than the real thing! 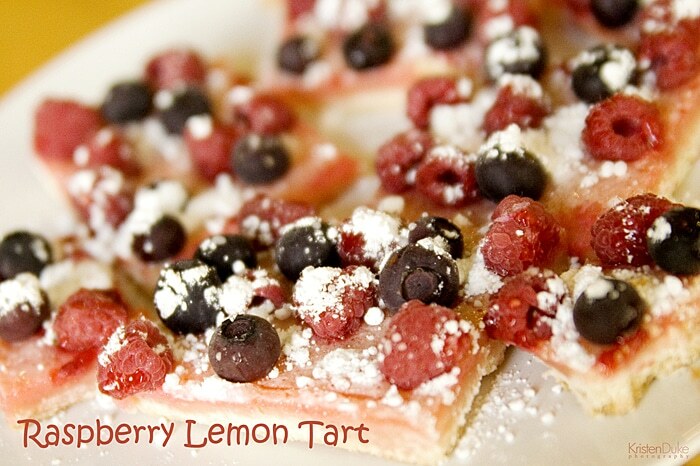 It is the perfect thing to add to your Easter brunch or anytime breakfast or brunch! Prepare cake mix in large bowl according to directions on box. Bake at 350 for 15-20 minutes or until center is just barely set. While cake is baking, prepare crumb topping. In large bowl of electric mixer combine butter, flour, cinnamon, brown sugar and vanilla until all crumbly. Immediately after cake is removed from oven, break crumb topping into marble size pieces with fingers, sprinkling over top. Put back in oven and bake an additional 10-15 minutes (topping will begin to look a less less wet/raw) let cool fully then dust with powdered sugar using a sieve if desired. 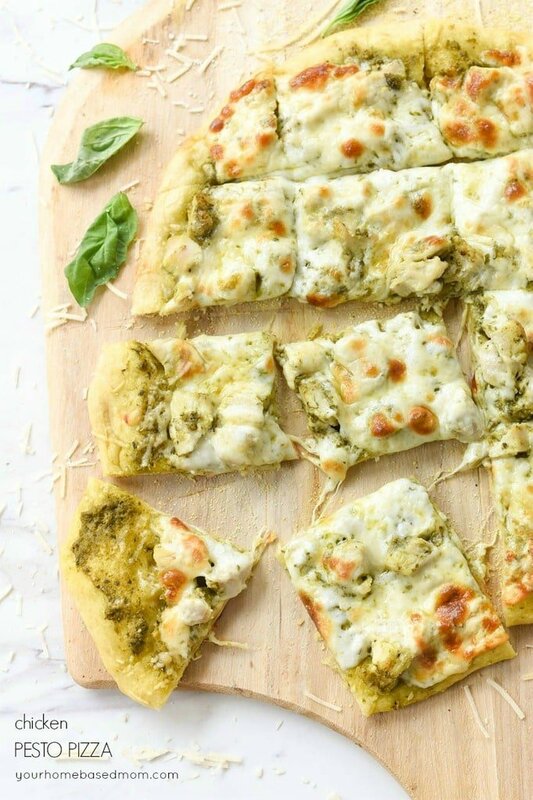 This looks SOOO good. I hope I can give it a try sometime soon. I wish I had it right NOW! I’m anxious to try it! It looks like the coffee cake I use to buy that I LOVED from Entenman’s Bakery when I lived in New Jersey. But they stopped making it, I can’t wait to make this! Thanks so much for sharing! What brand cake mix do you use? 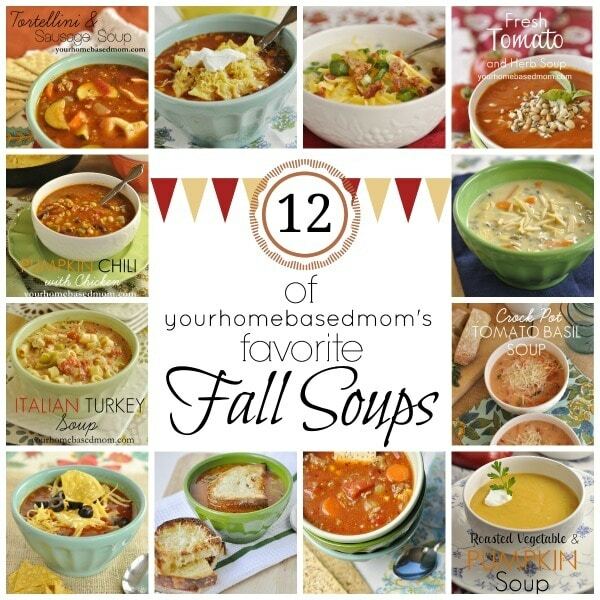 Looking forward to making soon! Did you mean brown sugar, rather than regular sugar for the topping? It should be brown sugar – thanks for the heads up.